Abstraction is “the process of considering something independently of its associations, attributes, or concrete accompaniments,” according to Google dictionary. The word abstraction comes from the latin verb abstrahere, which means “to draw away”. I like this insight. Abstraction is about removing things — but what are we removing, and to what end? Sometimes I like to translate words into other languages and then translate them back to English to get a sense of other associations we don’t commonly think about in English. When I translate “abstraction” into Yiddish and back, the result is “absentminded”. I like this, too. An absentminded person is running on autopilot, not actively thinking about what they’re doing… just doing it. Abstraction lets us run on autopilot, safely. All software is automation. Given enough time, anything you do on a computer, you could do with paper, ink, and carrier pigeons. Software just takes care of all the little details that would be too time consuming to do manually. All software is abstraction, hiding away all the hard work and mindless details while we reap the benefits. A lot of software processes get repeated again and again. If, during the problem decomposition stage, we decided to reimplement the repeated stuff over and over again, that would require a lot of unnecessary work. It would be silly at the very least. In many cases, it would be impractical. Instead, we remove duplication by writing a component of some kind (a function, module, class, etc…), giving it a name (identity), and reusing it as many times as we like. Software solutions should be decomposable into their component parts, and recomposable into new solutions, without changing the internal component implementation details. Generalization is the process of finding similarities (the obvious) in repeated patterns, and hiding the similarities behind an abstraction. Specialization is the process of using the abstraction, supplying only what is different (the meaningful) for each use case. Abstraction is the process of extracting the underlying essence of a concept. By exploring common ground between different problems from different domains, we learn how to step outside our headspace for a moment and see a problem from a different perspective. When we see the essence of a problem, we find that a good solution may apply to many other problems. If we code the solution well, we can radically reduce the complexity of our application. This principle can be used to radically reduce the code required to build an application. Identity — The ability to assign a name to it and reuse it in different contexts. Composition — The ability to compose simple functions to form more complex functions. Those relationships form the structure of the problem space, and the way you compose functions in your application forms the structure of your application. 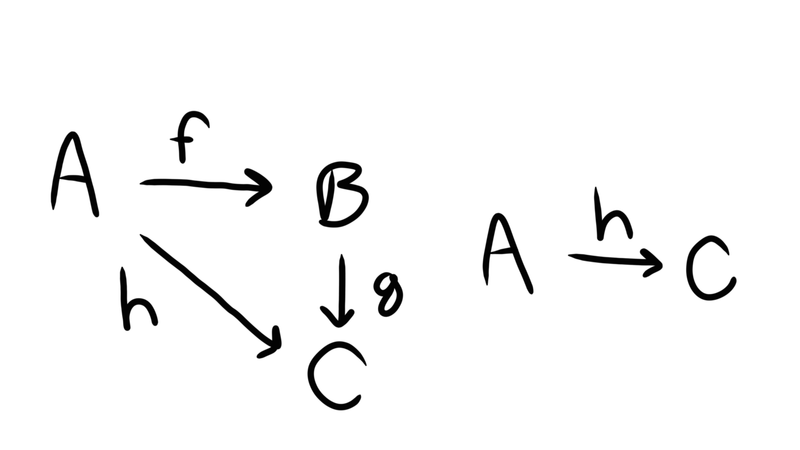 Good abstractions simplify by hiding structure, the same way h reduces A -> B -> C down to A -> C.
In this case, inc is just a specialized version of add. All curried functions are abstractions. In fact, all higher-order functions are generalizations that you can specialize by passing one or more arguments. Note that the definition of doubleAll required a trivial amount of code: map(f) — that's it! That's the entire definition. Starting with useful abstractions as our building blocks, we can construct fairly complex behavior with very little new code. Software developers spend their entire careers creating and composing abstractions — many without a good fundamental grasp of abstraction or composition. Video lessons on functional programming are available for members of EricElliottJS.com. If you’re not a member, sign up today.